This information is about lymphoma in children (0 to 14 years old). It is primarily intended for parents and carers of children with lymphoma. We have separate information for young people (15 to 24 years old) who have been diagnosed with lymphoma. This is aimed at young people themselves, but might also be useful for parents and carers of this age group. There is a lot of information on this page. You might want to read it in chunks. You can use the links to help you navigate to the parts that are most relevant to you. We have another page covering practical tips for parents and carers of children with lymphoma. Our storybook, Tom has lymphoma, is written and illustrated for younger children (primary school-aged). It is designed for you to read together to help your child understand what lymphoma is and the treatment it involves. We also produce a Young person’s guide to lymphoma, which is designed for young people (teens and young adults) affected by lymphoma. You can download these resources from our website or order a printed copy free of charge. Lymphoma is a type of cancer. It can develop when a type of white blood cell called a lymphocyte starts to grow in an abnormal, uncontrolled way. Lymphomas are the third most common group of cancers in children aged 0 to 14, after leukaemias and brain or other central nervous system (CNS) tumours. Lymphoma is very rare in very young children, but it becomes more common as people get older. Every year in the UK, more than 160 children aged 0 to 14 develop lymphoma. It is more than twice as common in boys than in girls. In most cases, the cause of lymphoma is unknown. It is very unlikely that anything you or your child has done has caused the lymphoma. There are lots of types of lymphoma. It is important to know what type of lymphoma your child has, as each type can be treated differently. Around half of children diagnosed with lymphoma have Hodgkin lymphoma. The other half have a type of non-Hodgkin lymphoma. There are several types of Hodgkin lymphoma, but they are all usually treated in the same way. Different types of non-Hodgkin lymphomas need different treatment. Other types of non-Hodgkin lymphoma can occur in children but these are rare. Most of the lymphomas seen in children are high-grade (rapidly growing) lymphomas. Although this may sound alarming, high-grade lymphomas are very likely to go into remission (no evidence of lymphoma) with the right treatment. In general, children have a better outcome than adults and cure rates are improving all the time. Lymphoma can be difficult for doctors to diagnose. Many of the symptoms (signs of illness) of lymphoma are also seen in other, less serious conditions. Children who have the same type of lymphoma can have different symptoms. Your child’s symptoms will depend on where in their body the lymphoma is growing. The first symptom that most people notice is a lump or several lumps that don’t go away after several weeks. You might be able to feel one or more lumps in your child’s neck, armpit or groin. These lumps are swollen lymph nodes, where abnormal lymphocytes are growing. Your child might have had swollen lymph nodes in the past when they had an infection, such as a sore throat. This kind of swelling is often painful but usually goes down within a couple of weeks. In lymphoma, the lumps are usually painless and do not shrink back down to how they were before. Many lymph nodes are deep inside your body and you can’t feel them from the outside. If the lymphoma starts in one of these lymph nodes, your child might get other symptoms depending where it is growing. If the lymphoma is growing in their chest, for example, your child might feel breathless or develop a cough that won’t go away. If it is growing in their abdomen (stomach), they might get abdominal pain. Night sweats, unexplained weight loss and fevers often occur together. You might hear these three symptoms called ‘B symptoms’. Having B symptoms can sometimes effect how your child needs to be treated. Lymphoma in children tends to be fast-growing, so symptoms might come on suddenly. The sections below have more details on the most common symptoms for each of the most common types of lymphoma in children. Children with Hodgkin lymphoma most often have swollen lymph nodes down one side of their neck but other lymph nodes might be affected. They might not have any other symptoms, but some children have ’B symptoms’. Other possible symptoms include difficulty shaking off infection, fatigue and anaemia (low red blood cells, which can cause tiredness and shortness of breath). Children with Burkitt lymphoma often develop large lumps of lymphoma, usually in their abdomen (tummy) or bowel. If this happens, your child might have serious abdominal swelling, pain and vomiting, or a build-up of fluid in their abdomen. This type of lymphoma can also cause fluid to collect in the chest. If this happens, your child might have difficulty breathing. Burkitt lymphoma can also grow in the parts of the jaw where your child has permanent teeth. This can cause swelling and can make the teeth wobbly or unstable. It can also involve the bone marrow, causing tiredness, bruising or susceptibility to infection, or it can occur in the central nervous system (brain and spinal cord), which can cause headaches. Lymphoblastic lymphoma most often causes swelling of lymph nodes inside the chest around the heart, in an area known as the mediastinum. This can put pressure on the trachea (windpipe). If this happens, you child might have problems such as coughing or wheezing and shortness of breath. These symptoms may be mistaken for asthma. Sometimes the swollen lymph nodes put pressure on the blood vessels inside the chest. In this case, your child might have a swollen neck, redness to their face and chest, and the veins in their neck might stand out. If fluid collects in your child’s chest, around one or both lungs, they might feel short of breath. Some children have lumps and nodules under or in the skin or scalp. Children with DLBCL often develop large lumps of lymphoma. These might be in internal lymph nodes (deep inside the body, rather than easily felt from the outside) or in extranodal sites (areas outside of the lymph nodes), such as the chest, abdomen and bones. Your child’s symptoms depend on what part of the body is involved; for example, if their bowel is affected, they might have abdominal pain or diarrhoea. ALCL can develop anywhere in the body, either in the lymph nodes or in extranodal sites such as the skin, liver, lung or bone. This type of lymphoma often causes pain and swelling. If your child is suspected to have lymphoma, they need tests to confirm the diagnosis. Your child is given an anaesthetic and has a small operation, known as a biopsy. This is done to remove all or part of an enlarged lymph node. An expert lymphoma pathologist looks at the sample under a microscope. If it is lymphoma, more tests are done to find out what type of lymphoma it is. Sometimes lymph nodes are easy to feel and easy to biopsy. Other times, they can’t be felt and can only be seen on an X-ray or with a scan. In such cases, your child’s specialists can give you more information about how they can get the lymph nodes they need to biopsy. If your child has lymphoma, they need more tests to find out what parts of their body are affected by the lymphoma. This is called ‘staging’. Knowing the stage of your child’s lymphoma helps specialists plan the best possible treatment for them. other scans, for example computed tomography (CT) scans, positron-emission tomography (PET) scans or magnetic resonance imaging (MRI) scans. Figure: A lady in a PET scanner. Posed by a model. Some children need a bone marrow biopsy and a lumbar puncture. These tests are usually done under general anaesthetic. They may be done at the same time as your child’s biopsy. A bone marrow biopsy involves taking some of the bone marrow from just below the hip bone using a special needle. Bone marrow is the spongy tissue in the centre of some of the large bones where blood cells are made. The sample is then examined under a microscope to see if any lymphoma cells are present. A lumbar puncture involves taking some of the cerebrospinal fluid (CSF) from your child’s back using a special needle. The CSF is the clear liquid that cushions and protects the brain and spinal cord. Lymphoma cells may be found in the CSF in some types of lymphoma. Your child does not necessarily need all of these tests – their specialist orders the most appropriate tests depending on what type of lymphoma they have and how it is affecting them. The results of your child’s tests help their doctors stage their lymphoma. Staging describes how much lymphoma your child has in their body and where it is. It is important to know the stage of your child’s lymphoma as it helps their doctors plan how much treatment they need. There are different staging systems, but in all of them the stages of lymphoma range from 1 to 4, with 1 being the earliest and 4 being the most advanced stage. You might also see the stage referred to by using Roman numerals: I, II, III or IV. Lymphomas that are stage 1 or 2 are often called ‘localised’; stages 3 and 4 can be called ‘extensive’ or ‘advanced-stage’. This may sound alarming but many children have advanced-stage lymphoma when it is diagnosed, and most children have a very good outlook. No one knows for certain what your child’s personal outlook is, but treatments for children with lymphoma are generally very successful. With the right treatment, most children who have lymphoma go into complete remission (no evidence of lymphoma) and stay in remission. You might be wanting to hear the word ‘cured’. Some doctors are reluctant to use the word ‘cure’, in case the lymphoma comes back. However, the risk of relapse (lymphoma coming back) reduces over the years, and your child is very likely to stay in remission. Cancer Research UK have a section on children’s cancer statistics if you would like to learn more. Be careful if you look at statistics. A lot of statistics are very general. Cure rates in children are much higher than in older people and are improving all the time. Your child’s lymphoma specialist is the best person to talk to about your child’s chance of remission, as they know all of your child’s individual circumstances. This information does not give advice on which treatment your child should have. Your child’s lymphoma specialist is the best person to talk to about the exact choice of treatment. Your child’s treatment depends on the type and stage of their lymphoma and other factors, including their age and general health. Treatment can also differ between people with the same type of lymphoma, as it is planned individually. Your child’s specialist should offer your child a clinical trial if there is one suitable for them. Some children might have antibody therapy with their chemotherapy or to treat lymphoma that has come back. Surgery is rarely used for children with lymphoma, except for children with a slow-growing type of Hodgkin lymphoma, called ‘nodular lymphocyte-predominant Hodgkin lymphoma (NLPHL)’. There is more about each of these types of treatment in the sections below, and you can follow the links to find more detailed information about these treatments. Doctors are continually trying to improve treatments for lymphoma. They do this by treating people in a scientific study called a clinical trial. Clinical trials are a way for specialists to work together to find out more about a particular illness and the best way to treat it. Many children are treated as part of a clinical trial. As treatment for lymphoma in children is generally very successful, many trials aim to limit side effects, especially in the long-term, while still giving every chance of making the lymphoma go into remission. Different trials have different aims. test new treatments that have been developed to destroy lymphoma cells but cause less damage to healthy cells. You can find out more about clinical trials in our dedicated section, Lymphoma TrialsLink. Ask your child’s specialist to tell you more about clinical trials, including whether there are any trials that may be suitable for your child. All trials are voluntary and you can opt out at any time if you change your mind. If you do not wish for your child to take part, or your child is in a trial but you don’t want to continue with it, your child’s doctors will use the best standard treatment instead. Chemotherapy means treatment with drugs. The drugs used to treat lymphoma are called cytotoxic drugs, meaning they destroy cells (‘cyto’ means cell and ‘toxic’ means poisonous). There are lots of different chemotherapy drugs used to treat lymphoma. Usually, several drugs that destroy cells in different ways are given together at the same time. Each combination of drugs is known as a drug regimen. These regimens are often known as abbreviations of the names of drugs they include, for example OEPA, COPDAC or ABVD. Each letter stands for one of the drugs. What chemotherapy will my child have? Your child’s specialist will explain which treatment they are recommending for your child. The best treatment regimens for each type of lymphoma have been worked out over many years in clinical trials, and research continues to improve treatment for lymphoma. You will be given information about what to expect and what side effects your child might experience. Chemotherapy is given in cycles. A cycle is a block of chemotherapy that is followed by some time off treatment to let your child’s body recover. Chemotherapy kills healthy cells as well as lymphoma cells, so the recovery time is needed for healthy cells to build back up. Most children with lymphoma have several cycles of chemotherapy over several months. They might have to stay in hospital for some of their treatment. Some treatment might be given as an outpatient. This is where your child goes into hospital for a few hours at a time to have the treatment but doesn’t have to stay overnight. The number of cycles of chemotherapy your child needs depends on the type and stage of your child’s lymphoma. Children with Hodgkin lymphoma are likely to have a PET scan after their first two cycles of chemotherapy. The results of the scan are used to decide whether your child needs more chemotherapy, and if your child needs radiotherapy after completing their chemotherapy. Remission induction takes several weeks and aims to get rid of all the lumps of lymphoma that can be seen on scans. Consolidation uses different combinations of drugs to destroy any lymphoma cells left behind. Maintenance is given to prevent the lymphoma from coming back. Children following this treatment plan spend much of the remission induction and consolidation phases in hospital. The maintenance phase is less intensive, and your child is most likely to go to hospital as an outpatient for treatment during this phase. Many chemo drugs have to be given intravenously (through a drip into a vein). Children usually have a central line put in to make this process easier, for example a Hickman® or Broviac® line or a PORT-A-CATH®. 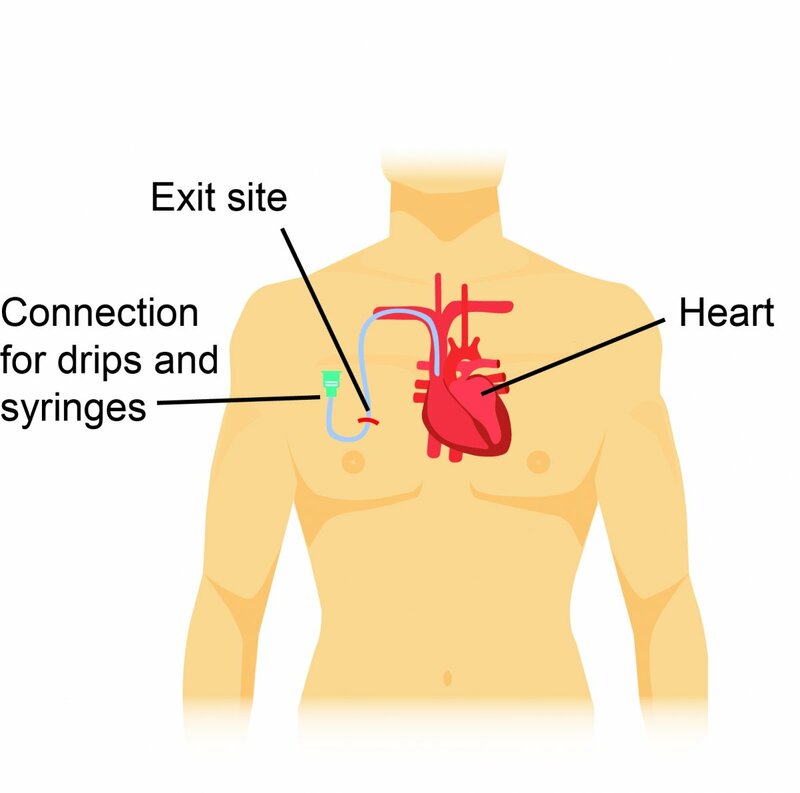 A central line is a soft tube that goes underneath the skin and into one of the main veins (superior vena cava) just above the heart. Your child has a small operation under general anaesthetic to put it in. Often, the central line is put in place while your child is having other tests that require a general anaesthetic. Once in place, it remains there throughout your child’s treatment and it should be painless. You are given instructions on how to look after the line when your child is not in hospital. A central line can also be used to take blood samples for blood tests as well as for giving chemotherapy. It is removed at the end of treatment, which also involves a small operation. Your child might need to take some drugs orally (by mouth). They might be given as tablets or capsules, or a syrup, depending on your child. Many children with non-Hodgkin lymphoma also have chemotherapy into the CSF (the fluid surrounding the spinal column). This is called ‘intrathecal’ chemotherapy. It is given during a lumbar puncture. Intrathecal chemotherapy prevents lymphoma spreading in your child’s central nervous system (CNS). Not all children need intrathecal chemotherapy. Your child is monitored closely throughout treatment. Their specialist checks how much lymphoma has been killed and how well your child is coping with the treatment. Radiotherapy is not often used for children with NHL. Some children with Hodgkin lymphoma have radiotherapy. Radiotherapy is usually only given if your child still has some lymphoma in their body after their first two cycles of chemotherapy. It is given after the course of chemotherapy has been completed. Radiotherapy uses powerful X-rays focused on the lymphoma cells to kill them. The type of radiotherapy used in lymphoma treatment doesn’t make your child radioactive. You can still be close to your child when they have had radiotherapy. The lowest possible dose of X-rays is used. This avoids damage to organs and growing bones and muscles. It also lowers the chance of late effects (side effects that develop long after treatment has finished). Radiotherapy is given over several days or weeks but each treatment only lasts a few minutes. Your child needs to keep very still for these few minutes. The hospital might have a special mould to hold your child in the correct position. The appointment might take a while even though the treatment time is short, as your child needs to be positioned very carefully to make sure the right area is treated. Everyone’s body makes antibodies naturally to fight infection. Each antibody sticks to a target (a certain protein) on cells, such as bacteria, and tells your body to get rid of the cell. Laboratory-made antibodies work in the same way and attach to a specific target to tell your body to destroy it. In antibody therapy, laboratory-made antibodies are used to kill lymphoma cells. The following treatments are mainly used in people over 18, but are being tested or starting to be used for people under 18 too. Rituximab is an antibody therapy that is used as part of treatment for some types of non-Hodgkin lymphoma, for example Burkitt lymphoma and DLBCL. Brentuximab vedotin is an antibody joined to a chemotherapy drug. It takes the chemotherapy drug directly to the lymphoma cells so it can kill them. It is used for some people with Hodgkin lymphoma or ALCL that has come back or didn’t respond to previous treatments. Surgery is rarely used to treat lymphoma as it is likely to leave behind some lymphoma cells and chemotherapy would still be needed. Children with a type of Hodgkin lymphoma called ‘nodular lymphocyte-predominant Hodgkin lymphoma (NLPHL)’ might have lumps removed surgically and no other treatment if the lymphoma is at an early stage. NLPHL is a slower-growing type of lymphoma and less likely to relapse (come back) after surgery than fast-growing types. If your child is treated surgically for NLPHL, they will be closely monitored afterwards to check for signs of relapse. Treatment is given with the aim of killing lymphoma cells but it also damages some of your child’s healthy cells. This can cause unwanted effects on your child’s body, known as side effects. Most side effects are short-term but some of them can be longer lasting. Some of them only become apparent weeks, months or even years after treatment (late effects). Your child’s medical team will give you information on all the drugs and treatments that they are recommending, including details of any side effects that can happen. Everyone responds differently to treatment, so it is difficult to predict exactly what side effects your child will get. Your child is monitored carefully for side effects throughout their treatment. Speak to your medical team if your child has any side effects. They can give your child treatments if needed and may have advice that can help. Some drugs are associated with particular side effects. Your child’s lymphoma specialist will tell you what to expect and what problems to look out for. effects on growth of bones and soft tissues. Antibody therapy is a targeted type of treatment and is designed to have fewer effects on healthy cells than other types of treatment. The most common side effects happen soon after treatment begins and can include fever, chills and shivering. These effects are most common with your first treatment. Antibody therapies can cause other side effects too, such as low blood counts. Your child’s specialist monitors them carefully for late effects and for their recovery during follow-up. They should tell you any signs of late effects to look out for. What happens if lymphoma comes back or doesn’t respond to treatment? You might want to skip this section if it doesn’t apply to you – most children are successfully treated for lymphoma and stay in remission. Sometimes lymphoma relapses (comes back after treatment). For a small number of children, the first treatment course isn’t enough to put their lymphoma into remission. In this case the lymphoma is called ‘refractory’, and your child might need a stronger treatment. They might even be changed to a stronger treatment part-way through their treatment course if their lymphoma is not responding to treatment as well as expected. a targeted drug, possibly as part of a clinical trial. When there is no evidence of lymphoma, this is called remission. Your child will have scans and tests during and at the end of their treatment to make sure they are in remission. Once treatment is finished and your child is in remission, they will have regular follow-up appointments at the clinic for many years. As time passes, the risk of relapse goes down. The doctors will also be checking that your child is growing and developing well, and checking for any signs of late effects. The few months that follow your child’s diagnosis will be difficult. There are many ways that you can get support, both emotional and practical. Please read our practical advice page, which addresses common practical concerns that parents and carers of children with lymphoma have. Our resources on talking to children about lymphoma are designed to help parents and carers talk to children who do not have lymphoma themselves but know someone who has been diagnosed. However, they give useful tips and there are animations that your child might find helpful. There are many organisations offering help and support to children with cancer, and their parents and carers. Barth MJ, et al. Immunotherapeutic approaches for the treatment of childhood, adolescent and young adult non‐Hodgkin lymphoma. Br J Haematol. 2016; 173: 597–616. Available at: www.onlinelibrary.wiley.com/doi/10.1111/bjh.14078 (Accessed October 2018). Burkhardt B, et al. Current status and future directions of T‐lymphoblastic lymphoma in children and adolescents. Br J Haematol. 2016; 173: 545–559. Available at: www.onlinelibrary.wiley.com/doi/10.1111/bjh.14017 (Accessed October 2018). Burkhardt and Lenz G. Management of paediatric and adult non-Hodgkin lymphoma: what lessons can each teach the other? Hematol Oncol. 2015; 33 Suppl 1: 62–66. Cairo MS and Pinkerton R. Childhood, adolescent and young adult non‐Hodgkin lymphoma: state of the science. Br J Haematol. 2016; 173: 507–530. Available at: www.onlinelibrary.wiley.com/doi/10.1111/bjh.14035 (Accessed October 2018). Cancer Research UK. Children’s cancer incidence statistics. Available at: www.cancerresearchuk.org/health-professional/cancer-statistics/childrens-cancers/incidence#heading-Six (Accessed October 2018). Cancer Research UK. Young people’s cancers statistics. Available at: www.cancerresearchuk.org/health-professional/cancer-statistics/young-people-cancers/incidence (Accessed September 2018). Cancer Research UK. Hodgkin lymphoma incidence statistics. Available at: www.cancerresearchuk.org/health-professional/cancer-statistics/statistics-by-cancer-type/hodgkin-lymphoma/incidence#collapseOne (Accessed September 2018). Cancer Research UK. Non-Hodgkin lymphoma incidence statistics. Available at: www.cancerresearchuk.org/health-professional/cancer-statistics/statistics-by-cancer-type/non-hodgkin-lymphoma/incidence#heading-One (Accessed September 2018). Galardy PJ, et al. Targeting childhood, adolescent and young adult non‐Hodgkin lymphoma: therapeutic horizons. Br J Haematol. 2016; 173: 625–636. Available at: www.onlinelibrary.wiley.com/doi/10.1111/bjh.14016 (Accessed October 2018). Giulino-Roth L and Goldman S. Recent molecular and therapeutic advances in B‐cell non‐Hodgkin lymphoma in children. Br J Haematol. 2016; 173: 531–544. Available at: www.onlinelibrary.wiley.com/doi/10.1111/bjh.13969 (Accessed October 2018). Jourdain A et al. Outcome of and prognostic factors for relapse in children and adolescents with mature B cell lymphoma and leukemia treated in three consecutive prospective “Lymphomes Malins B” protocols. A Société Française des Cancers de l’Enfant study. Hematologica. 2015. 100: 810–817. Miles RR, et al. Risk factors and treatment of childhood and adolescent Burkitt lymphoma/leukaemia. Br J Haematol. 2012; 156: 730–743. Minard-Colin V, et al. Non-Hodgkin lymphoma in children and adolescents: progress through effective collaboration, current knowledge, and challenges ahead. J Clin Oncol. 2015; 33: 2963–74. Available at: www.ncbi.nlm.nih.gov/pmc/articles/PMC4979194/pdf/zlj2963.pdf (Accessed September 2018). Okebe JU, et al. Therapeutic interventions for Burkitt lymphoma in children (Review). Cochrane Database Syst Rev. 2011. CD005198. Reiter A, Klapper W. Recent advances in the understanding and management of diffuse large B-cell lymphoma in children. Br J Haematol. 2008. 142: 329–347. Sandlund J and Martin M. Non-Hodgkin lymphoma across the pediatric and adolescent and young adult age spectrum. Haematology. 2016; 1: 589–597. Shankar A. Daw S. Nodular lymphocyte predominant Hodgkin lymphoma in children and adolescents – a comprehensive review of biology, clinical course and treatment options. Br J Haematol. 2012; 159: 288–298. Sickinger M, et al. Positron emission tomography-adapted therapy for first-line treatment in individuals with Hodgkin lymphoma. Cochrane Database Syst Rev. 2015; 1:CD010533. Stathis A, Younes A. The new therapeutical scenario of Hodgkin lymphoma. Ann Oncol. 2015; 26: 2026–2033. Turner SD, et al. Anaplastic large cell lymphoma in paediatric and young adult patients. Br J Haematol. 2016; 173: 560–572. Available at: www.onlinelibrary.wiley.com/doi/full/10.1111/bjh.13958 (Accessed October 2018). If you would like further information or would like to talk about any aspect of lymphoma, please contact us.